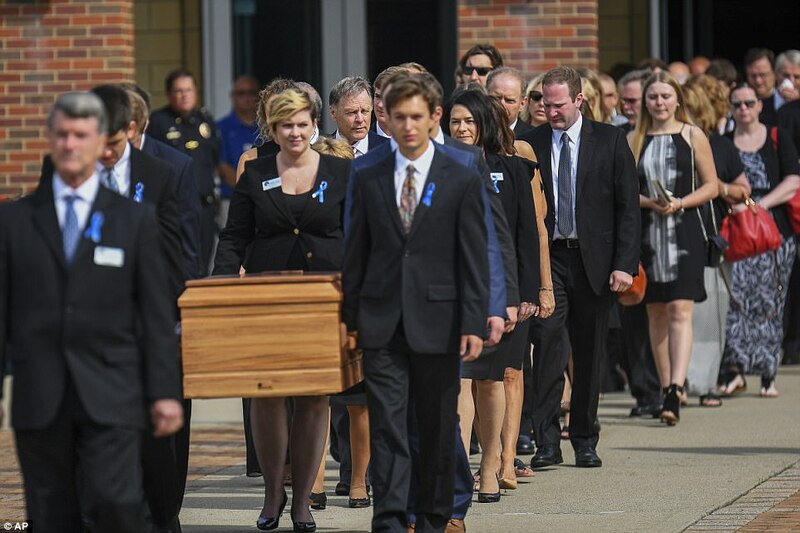 Friends and family members gathered in Ohio to say goodbye to an American student who just six died days after being returned to the United States in a coma following 17 months in captivity in North Korea. Otto Warmbier, 22, was arrested in the reclusive communist country while visiting as a tourist. He was brought back to the United States last week with severe brain damage, in what doctors described as state of 'unresponsive wakefulness,' and died on Monday. Thousands turned out to pay their respects to Otto at his funeral on Thursday, but many were told they would not all be able to attend the service at Pendery Center for the Arts. The hall, part of Wyoming High School, has a capacity of about 2,100, and many were seen being turned away at the door when the auditorium reached capacity. NK is a product of 'the Cold War' decades ago. It is always sad when an American is murdered in this hell hole. NK will only fall if America takes them down: Because China will not. ...my opinion and I stand by it! North Koreaâ€™s test-fired a ballistic missile toward Japan and said it would make an â€œimportant announcementâ€� Tuesday afternoon, prompting South Korea to examine if the regime had managed its first successful intercontinental ballistic missile launch. South Koreaâ€™s Joint Chiefs of Staff said the projectile was fired around 9:40 a.m. and flew about 930 kilometers (578 miles). Japanâ€™s Defense Ministry said it reached an altitude that â€œgreatly exceededâ€� 2,500 kilometers. It was airborne for around 40 minutes. The U.S. Pacific Command said in a statement it tracked a land-based intermediate range missile that landed in the Sea of Japan. But the lofted trajectory has led South Korea and the U.S. to now look at whether it was an ICBM, South Korean President Moon Jae-in said in a National Security Council meeting. South Korean actors Kim Sung-Oh, Seol Kyung-Gu, Son Ye-Jin, Do Ji-Han and Kim Sang-Kyung attend the 'Tower' Press Screening at CGV on December 18, 2012 in Seoul, South Korea. The film will open on December 25 in South Korea. 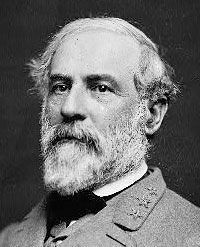 Memorial Day is celebrated on June 6th. It is a day when Koreans remember and honor the soldiers and civilians who died for their country. While it is for remembrance for all Koreans who died, the day is especially focused on Those who died during the Korean War from June 1950 to July 1953. There is a one minute silent tribute at 10am when sirens sound throughout the country, and all Korean flags are flown at half-staff. At the Seoul National Cemetery, a national commemoration ceremony is held every year. ... where does saber rattling end and REAL THREATS begin? The world is holding its breath today amid fears the crisis over North Korea could spiral in to global war after Donald Trump and Kim Jong-un made unprecedented threats to trade devastating missile strikes. Pyongyang's volatile dictator warned he was 'carefully examining' plans to make 'an enveloping fire' around the US island of Guam which is home to about 163,000 people and a sprawling American military base. It came after US President Donald Trump's apocalyptic warning that North Korea faces 'fire and fury like the world has never seen' over its nuclear program. America then released images of supersonic bombers flying over the Korean peninsula while American airmen in Guam have said they are ready to 'fight tonight'. 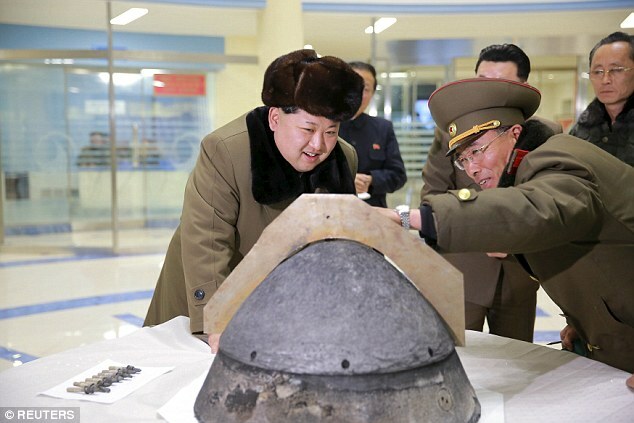 The North said the training mission 'proves that the U.S. imperialists are nuclear war maniacs'. North Korea is de facto province of China, and Kim Jong Un is her puppet dictator. Similar to South Korea, which is de facto one of the US states. The news says that Kim Jong Un will rock the US military base and the Guam island. Why Guam why an American base in S .. Korea? In World War II, thousands of US soldiers were killed in a battle on Guam Island. I do not remember some border incidents between the two Koreas. Strange, is not it? 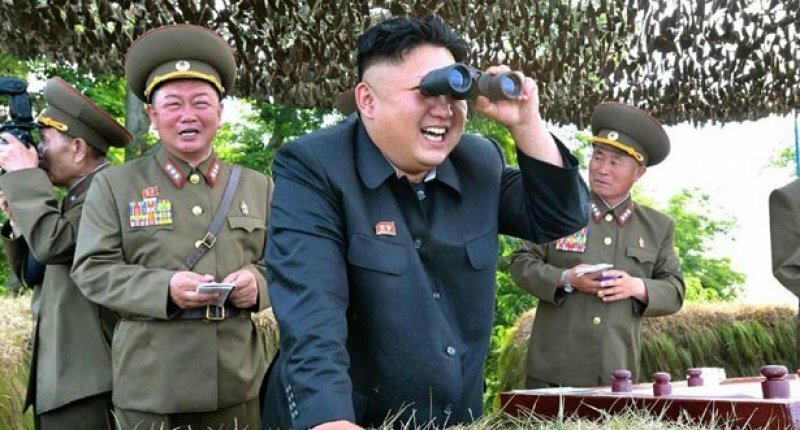 I bet that Kim Jong Un can not fire a rocket not only on Guam, but also a bullet or a South Korean soldier at the border unless approved by China. UNITED NATIONS (Reuters) - Two North Korean shipments to a Syrian government agency responsible for the country's chemical weapons program were intercepted in the past six months, according to a confidential United Nations report on North Korea sanctions violations. NK is only a 'Puppet' Nation in the global Plan: an enemy to keep folks in fear! they are insignificant: as The USA can Blow NK off The map from the Weapons we have in Space: Called 'Star Wars' and this has been in space since the: 1980's! SEOULâ€”North Korea said it conducted a sixth and significantly larger nuclear test Sunday, stepping up pressure on President Donald Trump in what is shaping up to be his biggest foreign policy crisis. The test came just hours after leader Kim Jong Un showed off what he described as a hydrogen bomb capable of being mounted on an intercontinental ballistic missile. The explosion at the nuclear test site at Punggye-ri in North Koreaâ€™s mountainous northeast triggered an initial magnitude-6.3 earthquake, followed by a magnitude-4.1 temblor that was possibly caused by a structural collapse, according to the U.S. Geological Survey. While it was unclear what set off the second quake, satellite imagery has captured evidence of tunneling activity at the nuclear test site in recent months. Any structural collapse might have been related to that. significantly expanding sanctions on the rogue North Korean regime. â€œThe new executive order will cut off sources of revenue that fund North Koreaâ€™s efforts to develop the deadliest weapons known to human kind,â€� the president introduced at a press conference. The order targets key industries, as well as essential shipping networks. The new order follows a new round of United Nations sanctions â€” the strongest ever â€” in response to North Koreaâ€™s test of a suspected staged thermonuclear weapon for its intercontinental ballistic missile. ... China turns a corner? other banks to stop conducting business with North Korea. The Peopleâ€™s Bank of China has instructed banks to fully implement United Nations sanctions, four sources familiar with the situation told Reuters. The United Nations Security Council recently approved a new sanctions resolution to punish the rogue North Korean regime for its earlier test of a suspected staged thermonuclear weapon, which the North intends to mount on its intercontinental ballistic missile. Chinese banks are not allowed to provide financial transactions for new North Korean customers, and they are encouraged to begin severing ties with existing customers. The banks received a notice earlier this week warning them that a failure to properly implement sanctions would lead to economic losses and damage their reputation. threatens to punish China for any failures to follow through on punitive sanctions." At this time, when many countries buy weapons, the only president of N. Korea "Kim Jon Un clearly stated its willingness to denuclearize". KJU is vassal of China. South Korea is vassal Republic of USA. So "re-unification" Korea "as in Germany" must come to agreement between USA and China. "Re-unification" of Germany came with agreement between USA and USSR. can lay some groundwork that THEY can both live with. 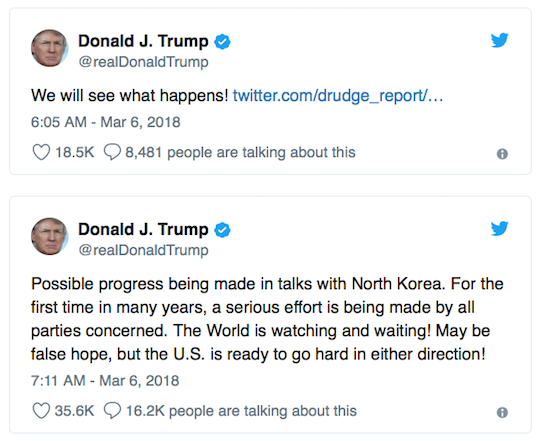 discuss denuclearization with a pair of tweets Tuesday. DJT: "I hope they're sincere. We're going to soon find out." WASHINGTON â€” President Trump will meet with North Korean leader Kim Jong Un by May for high-level talks over the denuclearization of the Korean peninsula, a South Korean official said outside the White House Thursday. The extraordinary and unexpected opening came through shuttle diplomacy by a South Korean delegation arriving in Washington Thursday. Trump heralded the development as a "major announcement"
after speaking with the South Korean president. Kim has agreed to a suspend missile tests while the talks go on, and there was no insistence that the United States and South Korea suspend joint military exercises. "I explained to President Trump that his leadership, and his maximum pressure policy, along with international solidarity, brought us to this juncture," South Korean national security adviser Chung Eui-yong told reporters after meeting with Trump at the White House. Chung met with Kim earlier this week. WILL NORTH KOREA GIVE UP NUCLEAR WEAPONS? North Korea has suspended activity at its main nuclear site, according to recent satellite imagery and expert analysis that appeared to support Pyongyang's offers to solve the crisis on the Korean Peninsula diplomatically. President Donald Trump's decision to accept an unprecedented invitation to meet North Korean supreme leader Kim Jong Un came after South Korean officials assured the Republican leader that Kim was willing to denuclearize in exchange for peace. As suspicions arose as to what North Korea's true intentions were, leading analysts Frank V. Pabian, Joseph S. Bermudez Jr. and Jack Liu found a major slowdown at the Punggye-ri nuclear test site in a report posted Friday to 38 North, a project of the U.S.-Korea Institute at the Johns Hopkins University's School of Advanced International Studies. "Imagery from early March had shown signs of continued tunneling excavations at the West Portal, including mining carts and significant amounts of new spoil deposits. Large groups of personnel were also noted in the open support areas serving the nuclear test siteâ€™s Command Center. However, imagery from March 17 showed no evidence of tunneling operations or the presence of any personnel or vehicles at any of the support areas including those near the Command Center," the report read. "This is an important development given efforts to establish high-level meetings between the United States, South Korea and North Korea. However, whether this is just a temporary development or whether it will continue over time is unclear," it added. no worry on that score." CNN is reporting that the United States and North Korea have been holding secret, direct talks in preparation for a summit meeting between Donald Trump and Kim Jong-un. CIA Director Mike Pompeo and a team of officials have been meeting with their North Korean counterparts to come up with a location for the meeting. Although the North Korean regime has not publicly declared its invitation by Kim Jong Un to meet with Trump, which was conveyed last month by a South Korean envoy, several officials say North Korea has since acknowledged Trump's acceptance, and Pyongyang has reaffirmed Kim is willing to discuss the denuclearization of the Korean peninsula. The North Koreans are pushing to have the meeting in their capital, Pyongyang, the sources said, although it is unclear whether the White House would be willing to hold the talks there. The Mongolian capital Ulaanbaatar has also been raised as a possible location, the sources said. "Only Nixon could go to China" is an old Vulcan proverb as Star Trek fans know. Will "Only Trump could go to Pyongyang" become an equally iconic observation? The talks between intelligence officials are laying the groundwork for a meeting between Pompeo and his North Korea counterpart, the head of the Reconnaissance General Bureau, in advance of the leaders' summit. Once a location is agreed upon the officials said that the date will be set and the agenda discussed in greater detail. 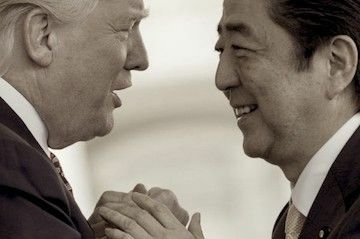 Japanese Prime Minister Shinzo Abe praised President Donald Trump for his success in getting North Korea to agree to preliminary talks with the United States. Abe made his remarks while visiting the president on Tuesday at his Mar-a-Lago club in Florida, where they discussed national security issues, trade, and the ongoing diplomatic process in North Korea. He praised the strength of the United States military as well as the success of the Winter Olympic Games in Pyeongchang, concluding that diplomatic relations in the region had changed dramatically since Trump became president. * Ahead of a summit next week between North Korean premier Kim Jong Un and South Korean President Moon Jae-In, lawmakers from the neighboring states were thought to be negotiating the details of a joint statement that could outline an end to the military conflict between the two countries. * Pyongyang and Seoul have technically been at war since the 1950-1953 Korean conflict ended with a truce â€” and not a peace treaty. Pyongyang and Seoul have technically been at war since the 1950-1953 Korean conflict ended with a truce â€” and not a peace treaty. Geopolitical tensions have occasionally flared up since the armistice, although to date both countries have managed to avoid another devastating conflict. probably in early June, if not sooner." CIA Director Mike Pompeo made a top-secret visit to North Korea over Easter weekend as an envoy for President Donald Trump to meet with that country's leader, Kim Jong Un, according to two people with direct knowledge of the trip. The extraordinary meeting between one of Trump's most trusted emmisaries and the authoritarian head of a rogue state was part of an effort to lay the groundwork for direct talks between Trump and Kim about North Korea's nuclear weapons program, according to the two people, who requested anonymity because of the highly classified nature of the talks. The clandestine mission, which has not previously been reported, came soon after Pompeo was nominated to be secretary of state. Various reports in American and South Korean state media Friday evening indicated that North Korean dictator Kim Jong-un announced the halt of nuclear and missile tests in his country. The reports did not specify whether the tests would conclude permanently. â€œThe North will shut down a nuclear test site in the countryâ€™s northern side to prove the vow to suspend nuclear test,â€� the announcement concluded. NK News, a website focusing on updates from the communist country, reported that Kim told a Workersâ€™ Party of Korea (WPK) meeting that there was â€œno needâ€� for such a nuclear program anymore. Reuters also confirmed the KCNA report. Sputnik, a Russian state site, added the detail North Korea will â€œjoin international efforts to halt nuclear tests altogether,â€� according to Kim. GOYANG, South Korea (AP) -- With a single step over a weathered, cracked slab of concrete, North Korean leader Kim Jong Un made history Friday by crossing over the world's most heavily armed border to greet South Korean President Moon Jae-in for talks on North Korea's nuclear weapons. 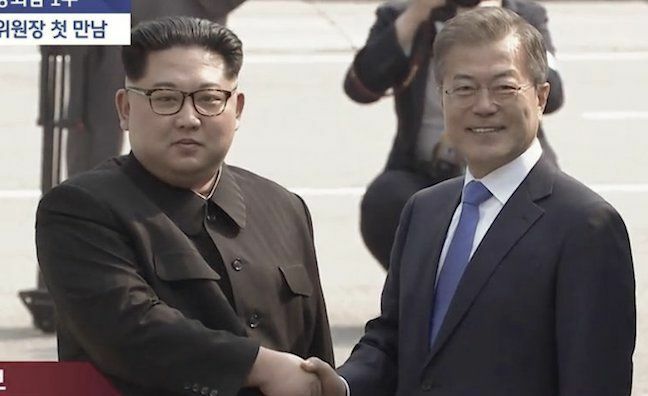 Kim then invited Moon to cross briefly back into the north with him before they returned to the southern side. Those small steps must be seen in the context of the last year - when the United States, its ally South Korea and the North seemed at times to be on the verge of nuclear war as the North unleashed a torrent of weapons tests - but also in light of the long, destructive history of the rival Koreas, who fought one of the 20th century's bloodiest conflicts and even today occupy a divided peninsula that's still technically in a state of war. Both leaders smiled broadly Friday as Moon grasped Kim's hand and led him along a blindingly red carpet into South Korean territory, where school children gave Kim flowers and an honor guard stood at attention for inspection, a military band playing traditional Korean folk songs beloved by both Koreas and the South Korean equivalent of "Hail to the Chief." Demilitarized Zone since the Korean War ended in 1953. 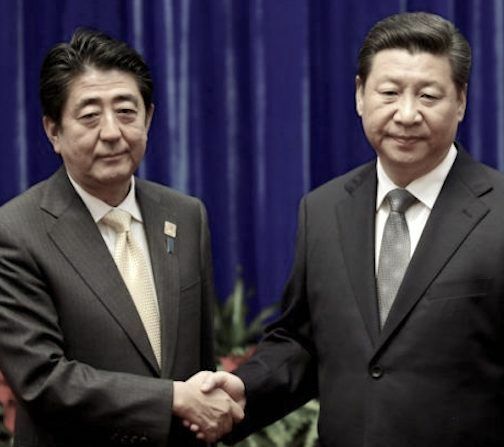 The governments of Japan and China, typically on the opposite sides of most regional political issues, both praised Fridayâ€™s summit between South Korean President Moon Jae-in and North Korean communist dictator Kim Jong-un. China is North Koreaâ€™s largest trading partner and closest ally. Japan, a U.S. ally, is one of North Koreaâ€™s most reliable targets of vitriol, abductions of civilians, and the occasional missile test, making Tokyo one of the loudest voices calling for denuclearization of the Kim regime. Prime Minister Shinzo Abe issued an optimistic statement about the in-person meeting between the leaders of both Koreas. â€œI welcome (the outcome) as the earnest discussion on denuclearization and other issues was a move toward the comprehensive resolution of various challenges surrounding North Korea,â€� he told reporters, according to Japanâ€™s Kyodo News Agency. He reportedly added that Japan would continue to cooperate with the United States and South Korea as the situation develops, since Kim is expected to meet with President Donald Trump following his meeting Friday with Moon. one finger click and a person with some Swiss background goes through a demarcation line. Watch the Soap opera. Producers: USA and China. Then war movie: USA, France , England, Israel...attack Iran. says he will 'dismantle' nuke sites beforehand! North Korea has announced on state media it will dismantle its nuclear test site just weeks ahead of a summit with President Donald Trump.The rogue nation will start to take the facility apart on May 23, with international media watching. The country's central news agency said the dismantlement of the nuclear test ground would involve collapsing all of its tunnels with explosions, blocking its entrances and removing all observation facilities, research buildings and security posts. Journalists from other countries, including the United States and South Korea, will be invited to cover the event. The nuclear site that will be dismantled is located in Pukyung, and the area around Pumyeong nuclear test site will also be closed. The dismantling will be just less than three weeks before a much-awaited summit in Singapore between President Donald Trump and North Korean dictator Kim Jong-un. Reports began surfacing late Thursday and Friday from North Korea?s Punggye-ri Nuclear Test Site, where the government invited reporters to witness the destruction of buildings outside the facility?s three tunnels and what Pyongyang claimed was the total destruction of the tunnels used for weapons testing themselves. North Korea invited an estimated 30 journalists from China, the United States, South Korea, the United Kingdom, and Russia to visit the site, which required a long train ride and hours of hiking towards Mount Mantap, which the North Koreans largely hollowed out to create the tunnels of the facility. Videos from the ceremonial detonation show the total destruction of the buildings outside of the facility. According to CNN and Xinhua reports, the reporters were allowed to walk outside of the three functioning tunnels and look in, where most have said they saw what appeared to be explosives lining the walls. Then they were moved to an observation deck constructed for this event, where they could watch the explosions occur. ?The dismantlement of the nuclear test ground is a vivid manifestation of the DPRK government?s fixed peace-loving stand to join in the international aspiration and efforts for total halt to the nuclear test and make positive contribution to building a nuclear free world,? the state-run Korean Central News Agency (KCNA) said in a statement following the explosions. I wonder why the weird rhetoric coming back and forth (especially from the US) in the face of a summit, seem totally unnecessary. Also the outrageous public demands. ... N&S leaders meet again ... seemingly good news. of the truce village of Panmunjom. South Korean President Moon Jae-in said Sunday that North Korean leader Kim Jong Un had reaffirmed his commitment to ?completely denuclearize the Korean Peninsula? and looked forward to meeting President Donald Trump on June 12, in the latest attempt by the two Korean leaders to keep recent engagement efforts on track. The remarks by Mr. 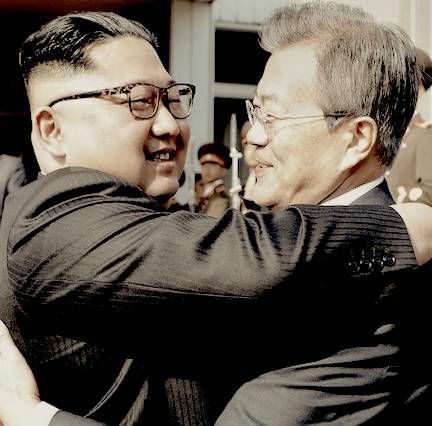 Moon came a day after the two Korean leaders met for an unannounced summit at the inter-Korean truce village of Panmunjom on Saturday, in the second meeting between the two men in as many months. Mr. Moon said the North Korean leader reached out to him on Friday for talks, and that the two sides agreed to meet at Panmunjom in a surprise summit that Mr. Moon said on Sunday was ?like a routine meeting between friends.? The meeting, together with optimistic remarks from Mr. Trump on Saturday, marked a swift reversal from Thursday, when Mr. Trump wrote an open letter to Mr. Kim calling off plans for a meeting and instead reminded the North Korean leader of the power of the U.S. nuclear arsenal. on North Korea while attempts to revive the summit are underway ..."
SEOUL, May 29 ? North Korean leader Kim Jong-un has dispatched one of his top aides to the US for talks ahead of his planned summit with Donald Trump next month, according to a person familiar with the issue who asked not to be named because the trip isn?t public. Kim Yong-chol, North Korea?s former spy chief, would become the highest ranked official from the isolated nation to visit the US since 2000, when Pyongyang sent Vice Marshal Jo Myong-rok to meet then-President Bill Clinton. Yonhap News Agency reported Kim Yong-chol will meet US Secretary of State Mike Pompeo, with whom he dined in Pyongyang earlier this month. The veteran official?s trip is another sign that preparations for the on-again, off-again June 12 meeting in Singapore are moving forward. Just three days after Trump abruptly called off the unprecedented meeting in a letter to the North Korean leader, the president appeared to confirm the talks were back on. Kim Yong-chol accompanied Kim Jong-un at all of his recent meetings with both Chinese President Xi Jinping and South Korean President Moon Jae-in, according to North Korean state-media reports. South Korea said today it wasn?t aware of the trip by Kim Yong-chol, who is vice chairman of North Korea?s ruling Workers? Party Central Committee. He?s set to land in New York on Wednesday on a flight from Beijing, Yonhap said. WASHINGTON (Reuters) - U.S. President Donald Trump, after meeting with a senior envoy from Pyongyang, said a planned summit with North Korea?s leader Kim Jong Un was back on for June 12 in Singapore. ?I think it?s probably going to be a very successful, ultimately a successful process,? Trump told reporters on the White House lawn. June 1, 2018 - 3:15 p.m.
President Donald Trump says he won't impose any additional sanctions on North Korea for the time being. Trump says "we had hundreds of new sanctions ready to go." But he says he won't impose them "until the talks break down." The president is referencing ongoing discussions with North Korea in preparation for a June 12 summit in Singapore with North Korean leader Kim Jong Un. An unnamed ?diplomatic source in Seoul? 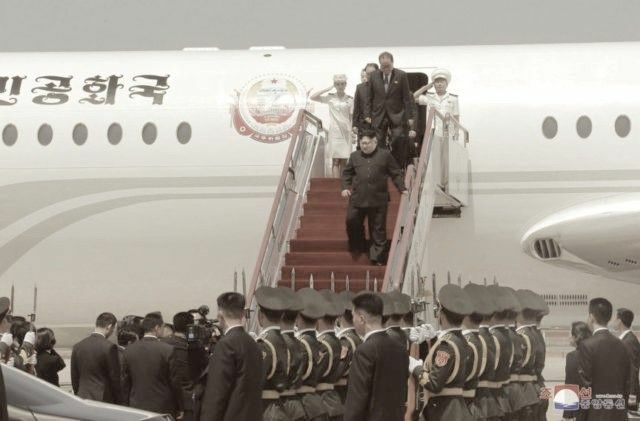 confirmed to the newspaper that Kim?s official airplane could only make the flight from Pyongyang to Singapore for the meeting with a refueling stop in China, which international media outlets speculated for months would be embarrassing to the dictator. ?North Korea originally considered a refueling stop in China, but chose to fly straight to Singapore,? the source reportedly said. ?There was some trepidation about flying the 4,800 km distance aboard Kim Jong-un?s own aging plane, so a third country is expected to supply it.? Chosun Ilbo says Singapore and China are the likeliest donors of a functional plane to carry Kim and his sister Kim Yo-jong, to the summit, and that discussions between Kim and Singaporean Foreign Minister Vivian Balakrishnan in Pyongyang this week in part involved the logistics of physically getting Kim to the tropical Asian country. ?We used to make fun of what they have ? it?s old stuff.? President Trump has described the summit as a ?getting-to-know-you plus? endeavor, telling reporters during a joint press conference with Japanese Prime Minister Shinzo Abe on Thursday, ?it?s gonna be much more than a photo-op.? ?I think it?s not a one meeting deal. It would be wonderful if it were,? he added, describing the meeting as ?fruitful? and ?exciting.? Kim and Trump are scheduled to meet at 9 a.m. local time on Tuesday, June 12, in Singapore. Democrats and Never Trumpers have argued since the 2016 election that Trump?s presidency would be dangerous and lead to nuclear war with North Korea. On the contrary, the Trump administration has embarked on an intense diplomatically-led strategy aimed at exerting ?maximum pressure? on North Korea. ?Democrats Childishly Resist Trump?s North Korea Efforts.? Diplomacy, Says Schumer ?Simply Wrong? California Democrat Ro Khanna came out in strong support of President Trump?s diplomatic efforts with North Korea on Friday, breaking with his party?s leadership. [email protected] is right that Democrats should support Trump?s efforts of engagement and diplomacy with North Korea. @SenSchumer is simply wrong on this issue. Democrats should learn from the blunder of the Iraq War,? he tweeted Thursday, along with an op-ed by New York Times columnist Kristof. Senate Minority Leader Chuck Schumer (D-NY) and other top Democrats are taking a hard line on the talks, ahead of the historic summit planned between Trump and North Korean leader Kim Jong-un in Singapore on June 12. They sent Trump a letter on Monday threatening to oppose easing any sanctions on North Korea unless five conditions were met, including the shutdown of all of North Korea?s weapons of mass destruction programs, including biological and chemical. As the president left for the G-7 summit on Thursday, Schumer took an additional dig. ?With ICBMs and nuclear warheads in the hands of North Korea, the situation is far too dangerous for seat of the pants negotiating,? Schumer tweeted on Thursday. Trump hit back in a later tweet, saying Schumer ?failed with North Korea and Iran.? ... ?We don?t need his advice!? he tweeted. SINGAPORE (AP) ? Spare a moment, as you anticipate one of the most unusual summits in modern history, to consider North Korea's leader as he left the all-encompassing bubble of his locked-down stronghold of Pyongyang on Sunday and stepped off a jet onto Singapore soil for his planned sit-down with President Donald Trump on Tuesday. While Singapore has authoritarian leanings, it is still a thriving bastion of capitalism and wealth, and Kim will be performing his high-stakes diplomatic tight-rope walk in front of 3,000 international journalists, including a huge contingent from the ultra-aggressive South Korean press ? sometimes referred to by Pyongyang as "reptile media" ? two of whom were arrested by Singapore police investigating a report of trespassing at the residence of the North Korean ambassador. There's wild speculation about how Kim will perform on the world stage, although one question was answered Sunday: His grim-faced, well-muscled bodyguards marched alongside his armored limousine at one point in Singapore, just as they did when he met the South Korean leader in April. But amid the curiosity is an even more fundamental question: Why is he taking this risk at all?